“The first time a customer does business with you, it’s a down payment on a long-term contract that they can cancel any time they want. The worth of that contract is the lifetime value of your customer. It’s up to you to keep them coming back over and over again.” Good advice from long-time friend and business mentor, David Garfinkel (DavidGarfinkel.com). When I poll my audiences, “Who’s familiar with the concept of the life-time value of a customer,” I’m amazed to find that fewer than 20 percent of these seasoned sales professionals raise their hands. Yet, understanding the concept of the Lifetime Value (LTV) of a customer can make the difference between creating a casual customer and converting them to a committed customer. If your business is going to be successful, scalable, and sustainable, you’ve got to have committed customers. Average sale amount * number of sales per year * number of years they do business with you * the number of referrals you get from a customer. Can your sales team calculate the value of a customer? If you’re a sales professional, you should know the first two numbers – average sales volume and average number of purchases. Just for the sake of example, let’s say you’re selling information technology, and that the average customer buys $10,000 worth of computer equipment from you about five times per year: they’re worth $50,000 a year. You might think that the third figure, how many years a customer buys from you, would be “forever” or some long-term number. Yet customers get promoted, or move away, or die, or their brother-in-law gets into the business and they buy from him. Or you or your company makes them mad (fill in your favorite “won’t do business with them” story), or they find a cheaper vendor, or they just stop needing what you sell (I won’t need to buy diapers until I have grandchildren). Customers buy from you for a finite time. In most industries, that’s about five years. So that means that this customer is worth $50,000/year * 5 years = $250,000. Compare the value of a $10,000 sale with a $250,000 lifetime value and it gets your attention. The last number is where a customer generates real value–the referrals they bring you that you wouldn’t get any other way. This factor really gets people’s attention. Let’s say that you can get one referral a year from this customer. Aw, come on, you can do that! You can estimate that this customer will bring in other customers of about the same size and type because of the “birds of a feather flock together” principle. Lifetime Value = $1.5 million! Just from a $10,000-per-order customer. If you treat your $10,000 customer like they’re worth $1.5 million, your business is going to rapidly grow and prosper. You can grow your business by paying attention to each of these four LTV factors. You can increase how much your customer buys each time by up selling in your product line or cross selling adjacent products. If you’re good, you can probably increase this factor by 10 to 20 percent by stealing business from another vendor. You can increase the number of times that your customer buys by extending your line card, offering more products for sale, or by helping your customer grow their business. This takes work, yet you can increase this factor by 10 to 20 percent. You can increase the number of years that a customer buys from you by managing the factors under your control that cause customers to leave, such as delivery issues, customer service issues, technology issues, and competitive pricing. This, too, takes work, yet you can probably increase this factor by 10 to 20 percent. On these three factors alone, if you can improve each by 10 percent, you can grow your business by 33 percent year after year. 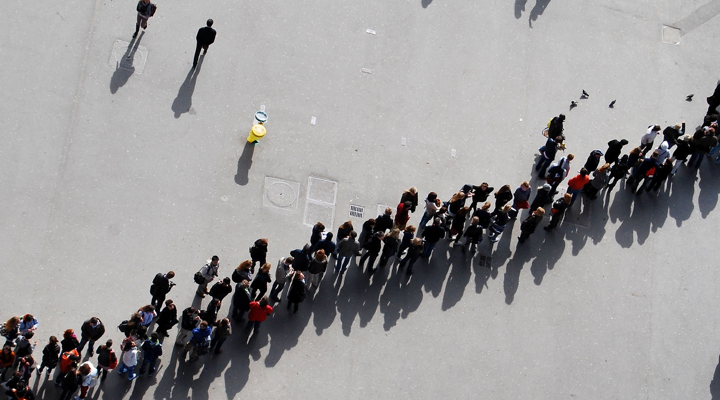 The fastest way to grow sales is pay attention to a customer’s lifetime value. The real leverage comes from the fourth factor, new customer influence and referrals. If you can get just one more referral a year from this hypothetical customer, you’ll move their lifetime value from $1.5 million to $2.75 million, or an increase lifetime of 183 percent with very little effort. You can get all this by treating your customers in a way that reflects their true value to your company and actively recruiting referrals from your now, ecstatic customers. The numbers in I.T. are big. But what if you’re working with a smaller-ticket sale? Then the customer referral value becomes the big lever. Let’s say that you’re selling deli sandwiches and that the average customer buys a $10 lunch from you about three times a month over five years and they bring along a friend or two. The lifetime value of this customer, before referrals, is $30/month * 12 months * 5 years or $1,800. With two referrals, they’re worth $5,400. Yet if you can get them to do more referrals, they become substantially more valuable. 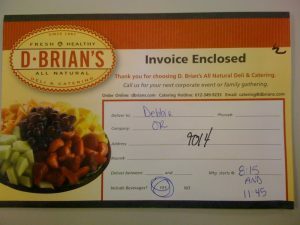 Yet D.Brian’s amps up the experience by delivering the receipt in a nice envelope. 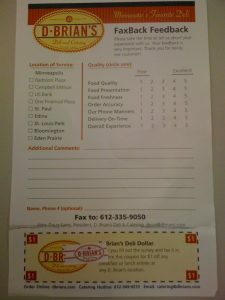 The receipt envelope also includes a feedback form with yet another coupon for the next in-store purchase. Any time that you can get a customer to write positive feedback about their experience, you reinforce their satisfaction and cement their commitment. If they write negative feedback, you get the opportunity to turn around the situation and learn from the circumstances. Either way, you win. Wait, there’s more. Each box lunch includes a sandwich club card with the first punch and a menu converting locals into a potential repeat customer. 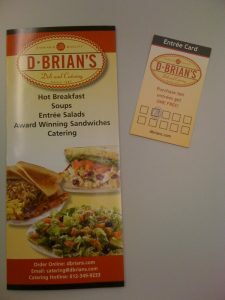 D.Brian’s offers three repeat-customer or referral mechanisms with each order, substantially improving the odds that they will turn a casual customer to a committed customer. So simple, yet I’ve never see this from any of the hundreds of catering companies that we’ve used in our events over the past 26 years. 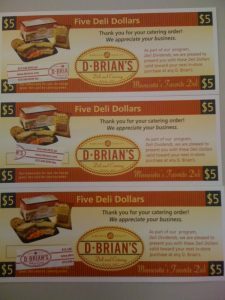 No, I’m not receiving any compensation or free sandwiches for talking about D.Brians. I think they’re doing an amazing job and increasing customer lifetime value, better than any other company at the $10 purchase price point. How can you morph this idea into your own customer retention and referral method? Four ideas: tickets to educational sessions for colleagues, no-charge annual assessments, a five percent credit towards their next order, and written customer feedback after a project. I’ve got lots more ideas, but this is a start. Let’s have a conversation if you think my ideas can help you succeed with your business expansion or if you want me to speak at a forthcoming meeting. Find a mutually agreeable time at MarksSchedule.com or contact me through LinkedIn.